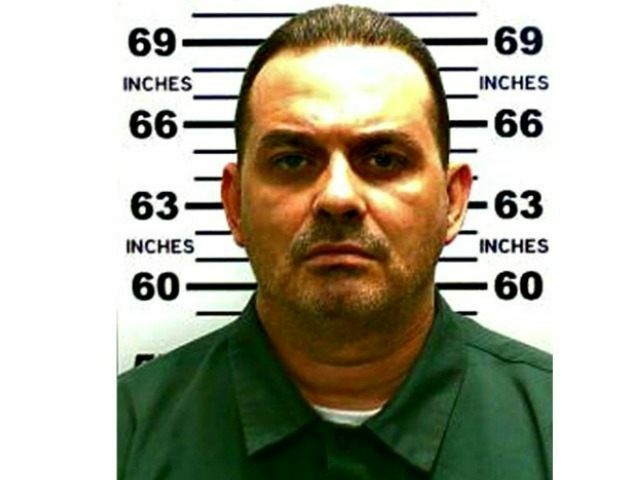 Richard Matt was shot dead at approximately 4 pm eastern today near the intersection of Highways 30 and 41, 7 miles south of the village of Malone, New York just north of Lake Titus. Elephant’s Head, where the search for second escaped convict David Sweat is now focused, is 3 miles due south of the intersection of Highways 30 and Highway 41, where the first escaped convict, Richard Matt, was shot and killed earlier today. Fugitive Richard Matt has been shot dead on Route 30, the Press-Republican has confirmed. Police are in pursuit of the David Sweat. Earlier in the day, DNA from escaped killers was confirmed at two more sites in Franklin County, the Press-Republican has learned. And authorities believe the men intend to escape into Canada. DNA had already confirmed that Matt and Sweat broke into a hunting camp in Mountain View last Saturday. 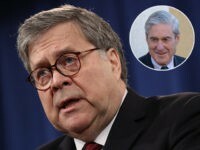 Forensic confirmation came back Thursday that proves Matt was in a second cabin, this one in the Town of Malone, informed sources tell the Press-Republican. Signs of intrusion were found, and a sample of feces was tested. DNA confirmation from a third site, also in the Town of Malone, came today. 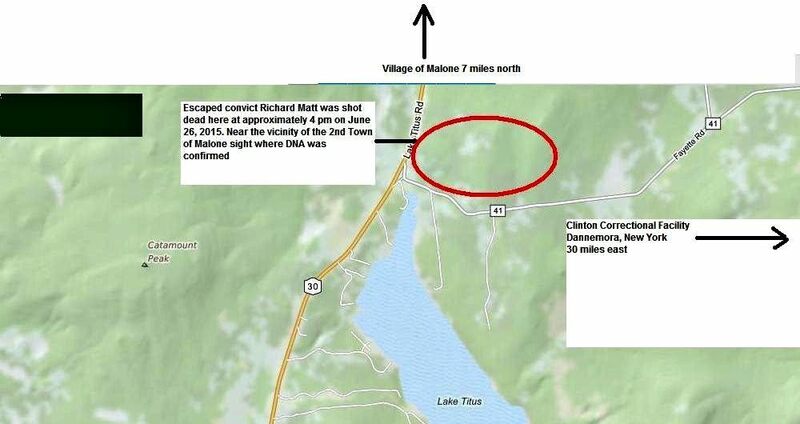 “Police killed Richard Matt near intersection of routes 30 and 41, close to the second cabin where his DNA was just confirmed,” Press-Republican editor Lois Clermont tweeted at 4:40 pm eastern time. “Owner of the camp on Fayette Road [Highway 41] found a liquor bottle sitting out and notified police. Shootout took place behind camp,” Press-Republican editor Lois Clermont tweeted at 5:10 pm eastern time. “Neighbor Patricia Duffy: ‘He called the cops, and bunch of them went up there,’ ” Clermont tweeted at 5:11 pm eastern time. Police forces have set up a tight perimeter around David Sweat, hope it will wrap up soon,” Clermont tweeted at 5:12 pm eastern time. “S[tate] P[olice] OFFICIAL: At approximately 3:45 p.m, June 26, A member of LE shot and killed a man believed to be escapee Richard Matt,” Press-Republican writer Kim Dedam tweeted at 5:38 pm est. “Matt was shot by a member of the Border Patrol Tactical Unit,” Press-Republican editor Lois Clermont tweeted at 5:40 pm eastern. There has been no comment yet as to whether Matt was armed at the time he was shot and killed, or if law enforcement believes that Sweat, who remains at large but it thought to be in the near vicinity of the search, is currently armed. The International Business Times reported that Matt had a shotgun at the time he was shot, and that he and Sweat exchanged fire with police, according to sources.